The College of Engineering continually measures its progress in reaching important goals through its Key Performance Indicators (KPIs). New recruiting, advising, and bridge programs have led to modest increases of female, international, and underrepresented minority students. 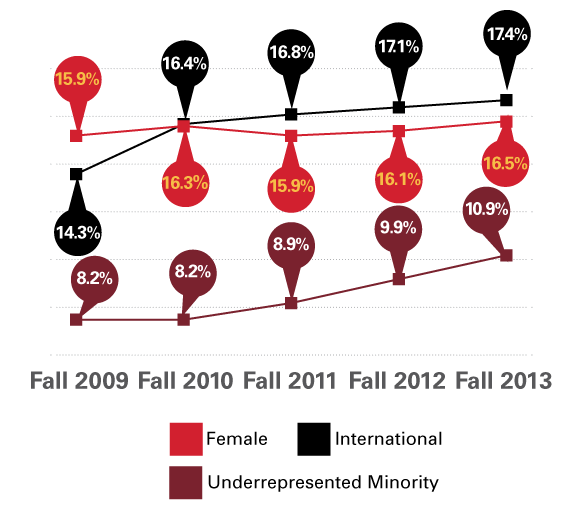 This measure is based upon enrollments at both the undergraduate and graduate levels. 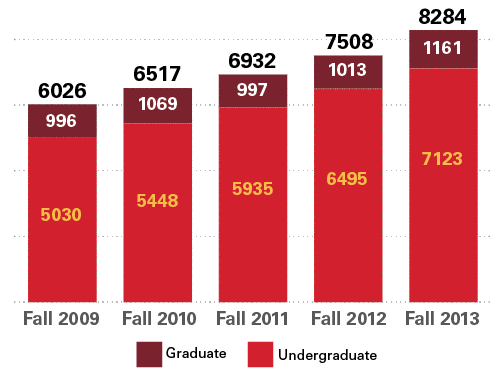 Enrollment has grown over the past five years to record levels. Demand at the undergraduate and graduate levels has increased as a result of initiatives to recruit students and efforts to improve retention and the academic success of students once on campus. The college ranks among the top dozen programs in conferring bachelor’s degrees and the top 25 in doctoral degrees, and is among the top 20 in bachelor’s degrees awarded to women.